We already have the two names of Mother's Day Contest winners ! Mother’s Day is coming and Sita Murt wants to reward you for your trust and loyalty doing a contest where we raffle two individual tickets for the special Sushi Mother’s Day Course of the MasterChef 3 ex contestant Andrea Vicens. It’s really easy to take part of it, you only have to follow the instructions above and enter in our Facebook or Instagram accounts. Communication to winners : Friday 29th April at 12:00am in our blog and by private message to winners on Facebook and Instagram. Contest Operation : Raffle in our social media accounts of two individual tickets to attend the special Mother’s Day course of Andrea Vicens from MasterChef 3 next 7th May in Barcelona. You can participate through our Facebook and Instagram, in each account we raffle one individual ticket, so there will be two winners, one for each social media account. Enter in our official account and make a comment in one of the three contest images saying which is your favorite dish cooked by your mum to win one individual ticket. Between those who have left a comment we will chose the winner by doing a random raffle. 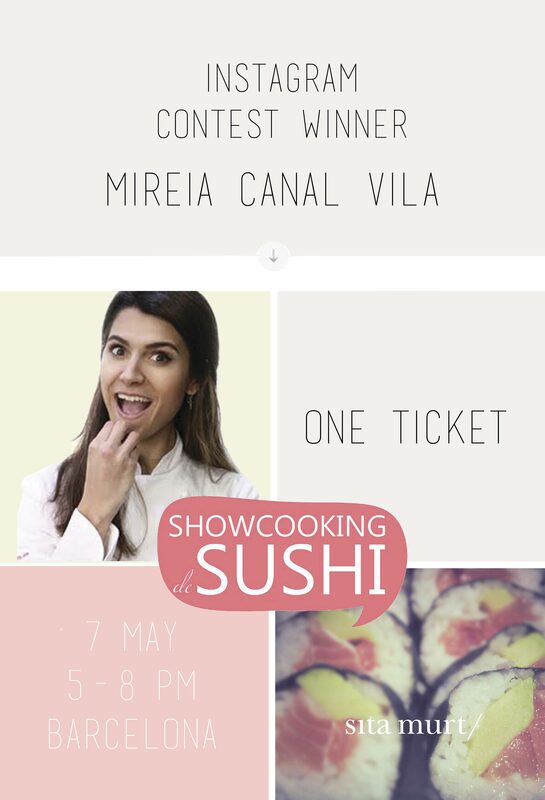 You have two options, the first one is to share our contest image, and the second, to post one picture with your favourite sushi, in both options you must tag @sita_murt and @andi_vicens and the hashtag #sushiconsitamurt to win one individual ticket. Between those who have participated we will chose the winner by doing a random raffle. * To participate you only have to chose one option and tag the accounts and the hashtag. To share our contest image on Instagram make a repost through an app like repost for Instagram or doing a capture with the mobile phone of our contest photo and publishing it in your personal account, always tagging Sita Murt, Andrea Vicens and the hashtag. *If the shared photo doesn’t have Sita Murt and Andrea Vicens accounts tagged, we won’t know that who is participating in because the social media won’t notify us. For that reason, it’s really important to tag our accounts in the photo to can participate in the contest.